Welcome to Free-Stencils.com . Stencils are fun to use and they can add beauty and charm in anything whether it is a wall, a piece of fabric, a cushion, a pillow, bed linen or a piece of furniture. Stencils are specially good to create repeat patterns and if your are a DIY lover you can easily beautify your surroundings using free printable stencils that I am offering on this website. 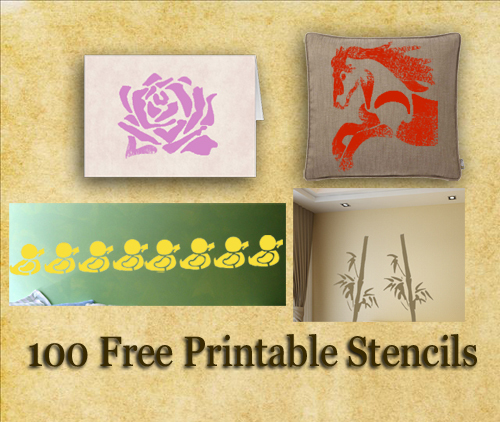 By using these stencils you will be able to make anything beautiful in a cost-effective way. I have made various easy to cut stencils like aphabet, numbers, butterfly, cherry blossom and many more stencils that you can easily cut using a sharp knife and paint either with spray paint, a brush or a sponge. You can mix and match various designs to create unique patterns on your walls, on fabric or even on furniture. Easy to cut stencils that you can use to create banners, educational tools and many more things. Cute stencils to decorate your baby's nursery or kid's room walls. You can also paint bed linen and furniture for your kid using these. Cute range of stencils that match needs of any baby shower Party. Images of different type of birds to decorate walls. Add fun and charm to any birthday party using these free fun stencils. Create uniform borders anywhere using these stencil patterns. Paint butterflies anywhere using various stencils on this page. Stencils of wine glasses, confetti and fireworks. Paint cherry blossoms in any room with the help of these stencils. Stencils of coffee cup and coffee beans. Cute Stencils of woodland creatures such as fox, squirrel and hedgehog and sea creatures such as crab and turtle. Cute stencils of Easter Eggs and other cute objects. Stencils of autumn and fall leaves to decorate your walls and bed linen. Beautiful stencils to create floral partterns anywhere. Decorate your walls with images of beautiful flowers with these stencils. Scary and spooky stencils to add color and fun to your Halloween party. Cute stencils to create lavender flowers anywhere. Stencil to create image of my most favorite animal anywhere. Stencils of numbers, from 0-9. Stencils of cute owls for your DIY crafts projects. Create scary Jack-o-lanterns using these pumpkin carving stencils. Create beautiful roses on walls or on pillows and cushions. The choice is yours. Cute stencils to help you creating thanksgiving related crafts. Free Printable Stencil of Tiger's Face. Love filled stencils to create things for your Valentine. Adorable free printable wall stencils to decorate bedroom walls, interior walls, exterior walls and bathroom walls.